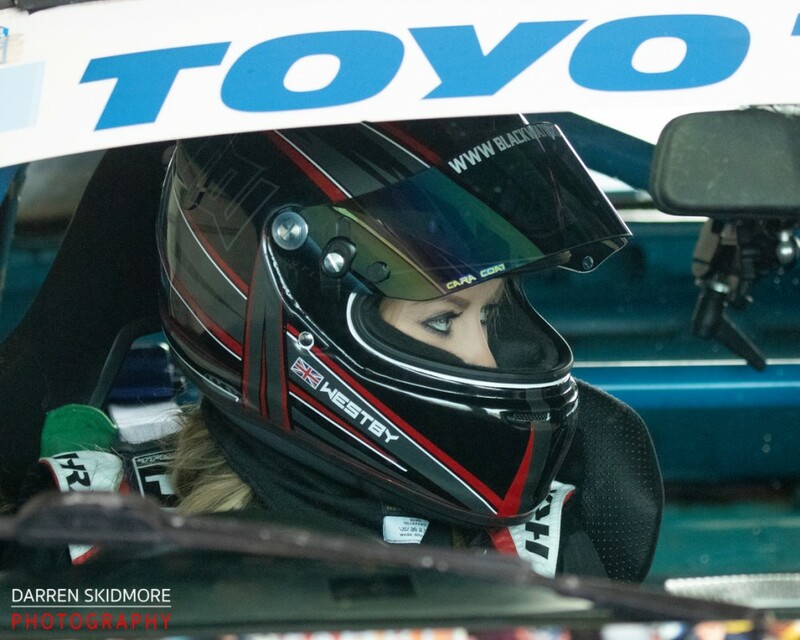 The first round of the 2019 BRSCC Toyo Tires Porsche championship saw me land my first podium, and take home my first trophy, from the series since I started racing back in 2012. I’d driven the car (with Michelle – see previous story) just the previous weekend, which was useful in getting me back into the groove of being on track again. A sadly depleted grid – the lowest opening round entry for at least 7 years – meant we were only going to be receiving half points but it also meant I had even fewer exuses to not finish on the podium – third at the very least. 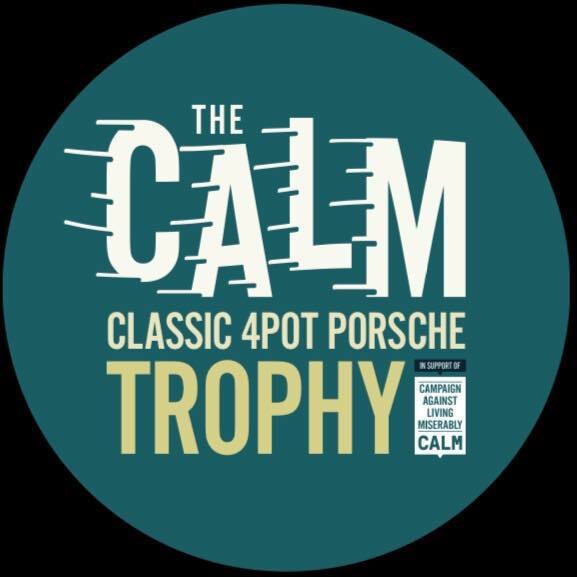 I would be up against Hugh Peart – expected to be a prime contender for the championship title this season, having finished second overall last year; Andy Pritchard – who sold his car and took a year out of racing; and John Jones – for whom this was to be his first racing weekend. 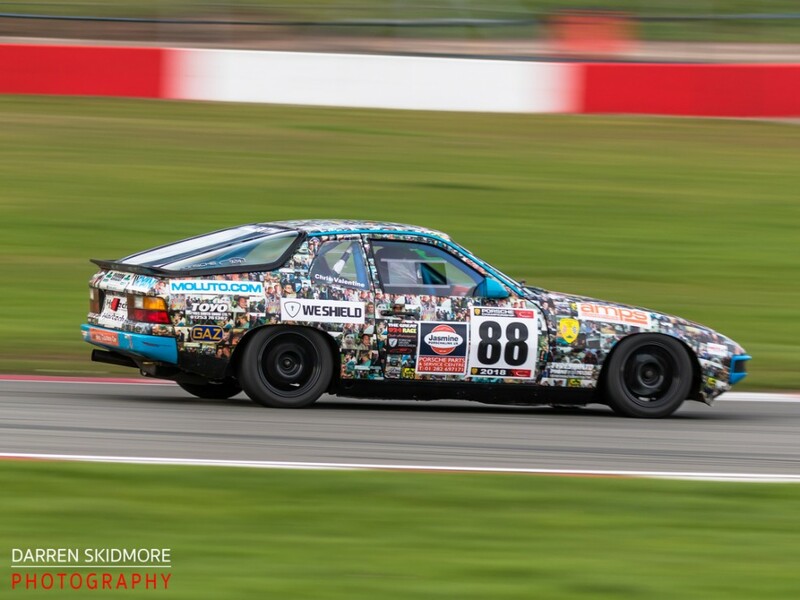 John was to be my Moluto team mate having bought the red 924 that Ryan Lowry raced briefly, and very quickly, a few seasons ago, winning his first race in it at Donington. 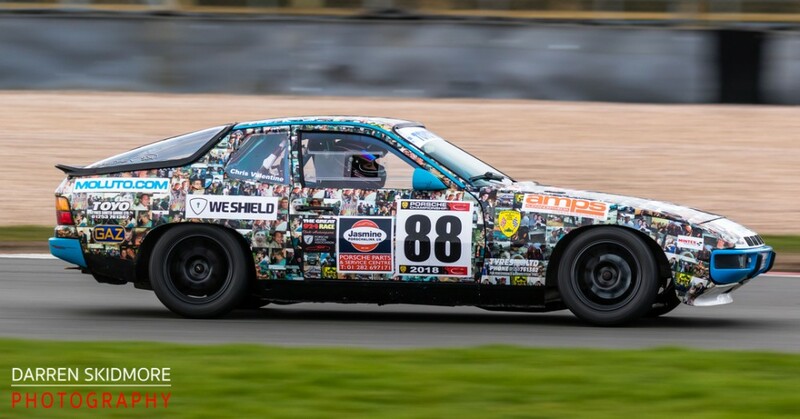 Andy’s car was bought from Steve Potts, who competed in the same championship a few years back, but who’d switched to other series and the car had laid idle ever since. Karl Rossin was on hand to help restore that car to racing condition, but even so, its setup wasn’t expected to be perfect. 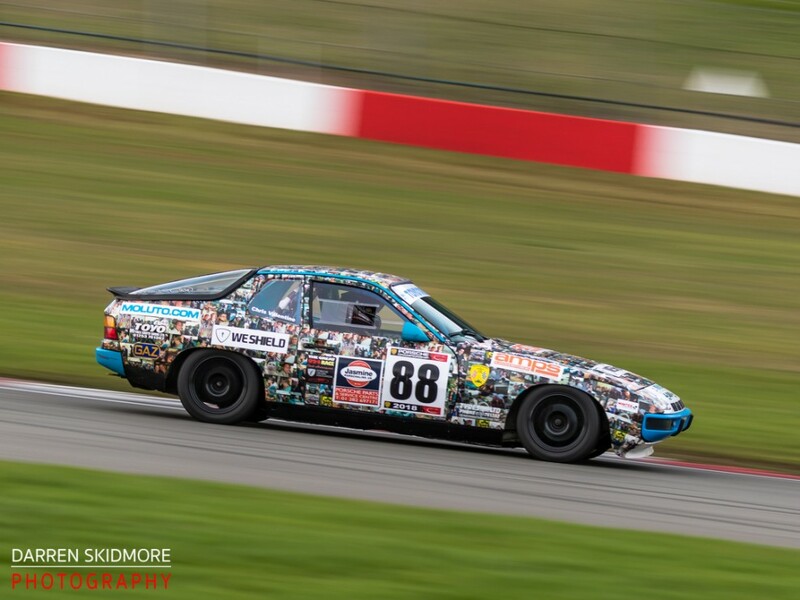 Despite our numbers, qualifying was busy as we were forced to share the track with the BRSCC Alfa Championshop – their numbers were also low, but not as low as ours. I was going out on brand new discs and pads, and after cooking new ones at Donington last year, was under strict instructions from Moluto mechanic Clive to take it easy for the first few laps, come in, then push for a position on the front of the grid. I obviously didn’t push quite enough as Andy managed to beat me, so I was a little disappointed. 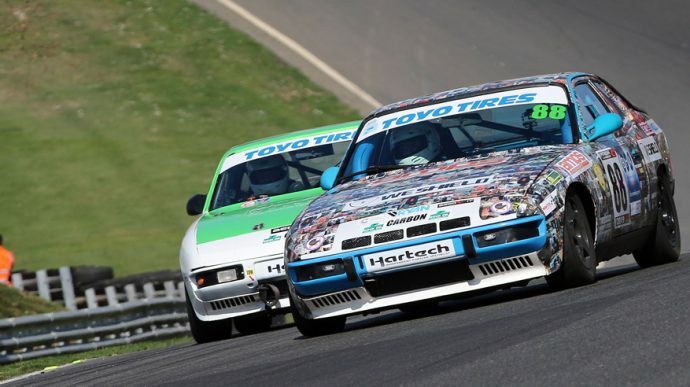 If you’re at all familiar with Brands Hatch you’ll know that the grid straight isn’t flat and the circuit had caught me out a few years ago and was the only venue where I’d managed to stall on the grid. This time I was determined to improve my starts and for both races I managed a quick get away – in fact I was past Andy at turn 1 (Paddock) and started to pull ahead of him and John as I desparately tried to keep up with Hugh. That I didn’t manage, but I did pull away into what I foolishly expected to be a comfortable lead. However, Andy and John must have been pushing hard and before long, the pair of them appeared in my mirrors. Having caught up with me obviously spurred Andy on and he took 2nd from me with a daring move up my inside at Paddock – and the battle between us then continued for the rest of the race, with John hanging on very well hoping one or both of us would make a mistake, providing entertainment for the small crowd – and good footage for the TV coverage being recorded by AJK TV. As my in-car video highlights show, I got past Andy again at Graham Hill Bend, following one of the lapping Boxsters, and held on to the lead to the flag to land my first ever 2nd place. For the second race I have to guess that Andy realised beating me was on the cards and sure enough, he and John were again able to eat away at the lead I’d established by starting off the front row. Again he made a move down the inside at Paddock – I should really have been ready for it! – and at the flag took 2nd – and his first PDA trophy – with me third and John 4th. All three of us had shaved a massive chunk off our qualifying times and I posted a sub-1 minute time for my final lap in both races. Our next races are at Snetterton in April, a circuit where corner exit speeds are even more crucial followed by very long straights. I’m already setting my sights on more podiums! Photos are courtesy of Derek Partridge.